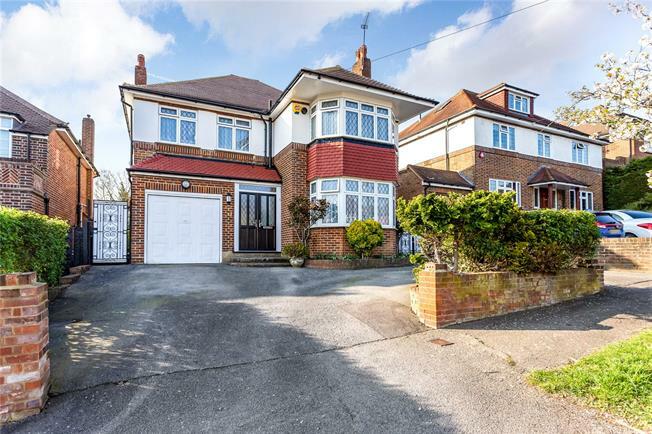 4 Bedroom Detached House For Sale in Stanmore for Asking Price £1,150,000. A bright and spacious four bedroom family home (1,958 sq ft/191.90 sq m) which is superbly presented by the present owners having been recently modernised throughout. The property features a spacious ground floor reception room, a bay fronted dining room a contemporary kitchen family room and an integral single garage. To the first floor the accommodation features a bay fronted principal bedroom with an en suite shower room, three further bedrooms and a contemporary family bathroom. Externally this pretty family home offers a superb rear garden and driveway parking for several vehicles. Located a few minutes walking distance from the stunning open expanse of the Bentley Priory Nature Reserve and circular walk, as well as being a short distance to the centre of Stanmore. This popular location is conveniently situated for all the local amenities of Stanmore offering excellent transport facilities with links to London via Stanmore underground station (Jubilee line) and to the north with and the M1, M25, A1 and A41 all located nearby. Sporting and recreational facilities are incredibly well catered for in the area with Stanmore cricket and golf clubs situated particularly close by, together with sailing at Aldenham Country Park, the David Lloyd and Village fitness centres. There are a number of excellent private and state schools in the vicinity including Haberdashers Askes, North London Collegiate and St Margaret's.